For example, most pet owners don’t want to replace flaps, so the PlexiDor doesn’t have flaps. These doors have see-through panels made from a special material called K9 Composite. 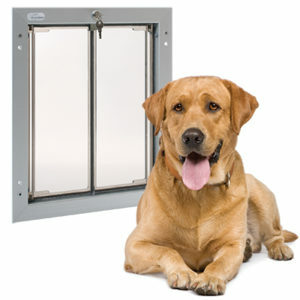 The panels are insulated, sturdy, and act as a window for the pets. They open with little effort and close without banging. Other features are the aluminum frame that won’t crack or warp, safety features with lock, key, and a detachable metal security plate, and an energy efficient design. 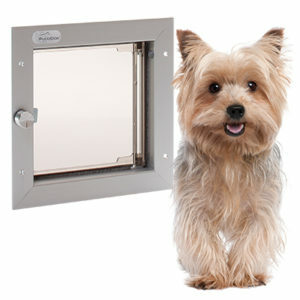 The small door is ideal for cats up to 24 lbs and dogs up to 9 lbs. This is a single panel design, and the energy efficient acrylic thermopanel opens from left to right with precision smoothness. Even the smallest kitten or puppy can push the door open. This door has a spring-loaded 4-way lock. It can be set to IN ONLY, OUT ONLY, IN AND OUT, or LOCKED. The small units do not come with a steel security plate. This is a perfect door for dogs up to 40 lbs. The door has shatter resistant, dual thermo-pane acrylic panels that open with a gentle push and close tight without banging. Each panel is lined around all four edges with snug fitting, high density, industrial weather seal. The door provides superior draft control. The large door shares the design and features of the medium door, but is intended for dogs weighing up to 100 lbs. Just like all PlexiDors, it reduces air conditioning and heat loss. The panels on the PlexiDor PD Door XL and PD Wall XL are manufactured using a solid 3/8” sheet of shatter resistant acrylic, and they are virtually indestructible. The door is suitable for larger dogs up to 220 lbs. The panels also come equipped with factory installed chew proof aluminum trim around all four edges and on both sides of the panel. The electronic door has a composite panel that slides up and down like a miniature garage door. When inactive, the panel acts as a security door. The door works on an RFID system and will only open for a pet with the right key.